This fancy chicken dinner tastes like something you would order in a restaurant. 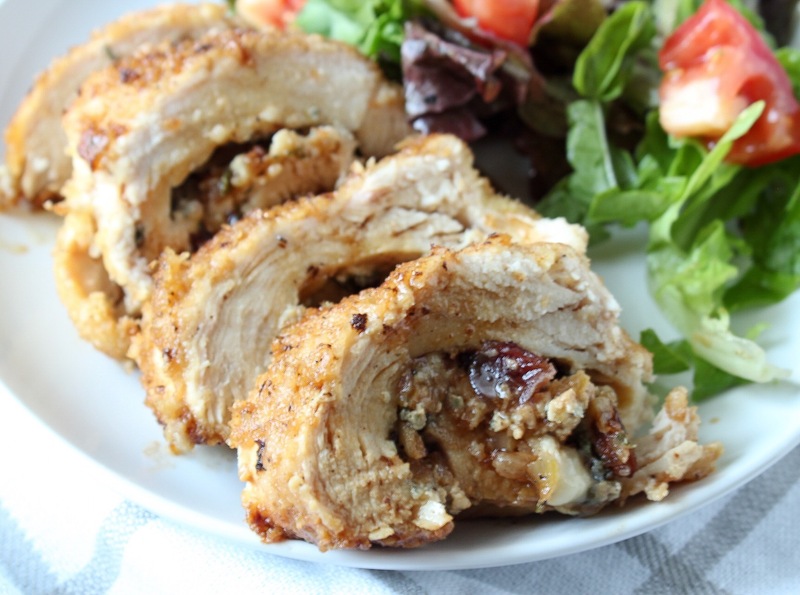 The dried cranberries burst with flavor and the cheese is slightly melted on the crispy chicken. Whenever I go out to eat, I usually don’t order chicken. Why? Because it is something I make at home, a lot. When I’m eating out I want to try a new dish, something I hardly ever buy or cook. Well if I came across this dish on a restaurant’s menu, I might change my philosophy on ordering chicken! It belongs there! It’s that freakin’ good. It is a little labor intensive, so save it for a weekend. But it is well worth the work! In a medium-sized saute pan, heat the olive oil over medium-high heat. Add the onions and cook for 5 minutes. Turn heat down to medium and add the garlic, cook for 1 more minute. Add the chopped sage and salt and pepper and cook until the onions are translucent. Add the dried cranberries and cook until heated through. Remove pan from the heat and let cool 10 minutes. Mix in the Gorgonzola cheese and set aside. Place the chicken breasts on a cutting board and place ¼ cup of the stuffing down the center of each breast, then roll chicken together. Tie the ends with string if needed. Place the egg in a shallow bowl and panko crumbs in another bowl. Dip the chicken into the egg, then into the panko crumbs until completely coated. In an cast iron skillet, melt 4 tablespoons of butter over medium high heat. Place the chicken in the pan and brown all sides, about 8 minutes. Then put the skillet in the oven and bake the chicken 15-20 minutes, until the internal temperature of the chicken reaches 165 degrees. After the chicken is removed from the oven, cut off the strings and place chicken on a covered plate to keep warm. Place skillet back on stove and heat over high heat, deglaze it with wine. Boil until reduced to 1 tablespoon, 1-2 minutes, then add the chicken stock. Boil until reduced by half, 3-5 minutes, then add salt and pepper to taste. Remove from heat and add remaining 1 tablespoon butter. Cut each breast in half and drizzle sauce on top.